Meanwhile in Russia, the to and fro between the actual Bolsheviks and their Allied/White Russian opponents proceeded with Bolshevik forces attempting to assert themselves in newly independent Baltic states by advancing in Riga (Latvia) and Reval (now Tallinn, Estonia; both on January 2) and to beat back the rebellion led by Admiral Kolchak with supporting Czech legions in east Russia – the Bolsheviks took Ufa and Sterlitamak (December 31) immediately after losing Birsk (30; 808 miles due east of Moscow). The uproar spread to Pressburg (now Bratislava, Slovakia) where the newly independent Czechoslovakians occupied the city (January 1) and the following day the Hungarians, who comprised almost half of the population, rose up against them. But Captain Hermann Detzner delivered the eccentric story of the week when he surrendered his German New Guinea Colonial Security force of 20 men to the Australians (January 5) after holding out on the run for four years having yielded the territory to the Aussies in the opening weeks of the war. Hurrying back to Leigh Drive, he yelled the good news about Christmas leave to the few men he passed. Mrs Fluter, kindliest of women, said she could have managed easily had the lads been staying over the holiday and she thought her husband might even be disappointed that they were not to share the good times together. With money in their pockets, the brothers bought a turkey in the market place along with fruit, sweets… and Turkish cigarettes, probably costing 4d(2) for ten instead of the usual 2d for English – their rich aroma seemed to lend an air of opulence to that small home. (2) £1 in 1914 would equal £109.69 in 2017 according to the Bank Of England inflation calculator. 4d/fourpence then would be the uninflated equivalent of 3.33p now so… £3 65p with 103 years worth of inflation (but then consider all the VAT and purchase tax changes in the interim). To their great relief, the Battalion joined the mass evacuation on December 18-19, Saturday-Sunday overnight. Singing their own variation on a music-hall song – “We were sailing away from Suvla Bay” – they voyaged the few hours to Allied Mediterranean HQ at Lemnos. 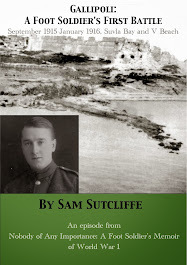 There, Sam’s sense of gloom and guilt about the defeat lifted to a degree when he reunited with brother Ted – who’d missed Suvla Bay after being dragooned off the troopship that carried the Battalion to Lemnos back in September… because he’d lost his front teeth in a fight and was deemed unfit to be shot at until he’d had them replaced (yes, I know, that ruling wasn’t entirely daft, but it is odd and funny). ‘Christmas nearly upon us and, next morning, our generous Major(3) had our crowd assemble and announced that arrangements had been made for a supply of beer, lots of it, to be collected from the Forces’ Canteen. Volunteers, genuine on this occasion, set off, carrying the large dixies in which the cooks normally prepared stews or tea. When they returned, noticeably more talkative and cheerful than before, they carried far more beer than it appeared likely we could cope with. The distribution of cakes, biscuits, Christmas puddings and sweets from the parcels of absent comrades followed – such a plenitude of good eatables compared with the scarcity during recent months. 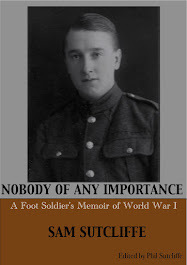 (3) Major Harry Nathan, that is, a revered figure in Sam’s 2/1 Royal Fusiliers period who crops up again, in a cameo role, towards the end of the Memoir. Throughout, in line with his policy of aliasing most people and places for one reason or another, my father calls him “Booth”. Rapidly promoted from Lieutenant when the Battalion formed in September, 1914, Nathan became CO at Suvla in mid-November, according to his biographer H. Montgomery Hyde (Strong For Service, W.H. Allen, 1968, long out of print – but merited because in subsequent civilian life he became an MP, a Lord, and ultimately a Minister in Attlee’s post-WWII Government). (4) Strong For Service says that, while he was eating his Christmas dinner, Nathan received the order that the Battalion remnants must return to Gallipoli, and they shipped out on Boxing Day, December 26. ‘No Signals work was required at that time, for the Battalion’s numbers had dwindled to about Company strength  and our work concerned simply helping to prepare for evacuation.Our Signals group landed a lovely job which consisted of going to a large dump near the beach and gradually dispersing its contents: canned and bottled food and drink intended as extras for officers – anything that would keep well in cans, boxes, cartons, with smoked items in cotton wraps, also biscuits, some cakes and sweets, wines, beers, but not much in the way of spirits. We loaded these good things on to small mule carts. A hundred years ago this week, in the aftermath of the Armistice… US President Wilson met British PM Lloyd George in London (December 27), the day before the announcement of the General Election results – which now look rather significant. Despite first votes for all men over 21 and women over 30, in a way it was no-change. The war-time Lib-Con coalition continued, but with the Libs split and undermined long-term – the Tories under Bonar Law won 382 seats with 4,000,000 votes, while Lloyd George’s Coalition Liberals took 127 seats with 1,300,000, and Asquith’s “traditional” Liberals got the same number of votes but only 36 seats, down 236. Meanwhile, Labour came second in the popular vote with 2,100,000 and landed just 57 seats and Sinn Fein scored 73 from 476,000 votes (then didn’t attend as they prepared to launch the Irish War Of Independence the following month). Proportional representation would have rewritten the whole thing! Even so, although that added up to continuity of a sort, in Berlin recurring civil unrest saw revolutionary Navy sailors pitted against the Army (December 24) with the military winning for the Government, such as it was. In Posen, Prussia, a long-standing territorial dispute with Poland erupted into fighting the day after Jan Paderewski delivered a speech in Poznan (December 27) which seems to have instigated the Greater Poland Uprising. And further east, jockeying by all concerned proceeded. Admiral Kolchak’s anti-Bolshevik Russian and Czech force drove east to take Perm, East Russia, 800 miles from their base in Omsk, where he’d been declared Dictator five weeks earlier. At the same time, the British escalated their running interference in former Russian states now striving for independence: they entered Batum, Georgia, previously occupied by the Turks (December 27), and Riga, Latvia (29) while the cruiser HMS Calypso captured two Bolshevik destroyers off Reval (now Talinn), Estonia. ‘Like all such hospital trains during that war, ours was met by Red Cross workers – those volunteers fortunate enough to possess cars. First they handed me that ever-welcome cuppa, then a long envelope and a tag with “Lewisham Hospital”(2) written on it. A very nice lady looked in through the open carriage door and invited the three men nearest to her, and that included me, to go along with her. So, off across the river in her chauffeur-driven car – my first visit to that part of London, though I recalled that a lad with the Roman name of Praetor(3) from pre-war office days, had lived in that area. “Care and observation” was given as the reason for my presence there. Kindly doctors spent time going over my abdomen, fingers probing here and there and finally settling in one spot. Some slight damage, they noted, from my digestive upsets as a prisoner, and the upheavals caused by excessive kindness after my return to the Allied lines. But it seemed I had been more fortunate than some repatriated men. They warned me to be careful about my diet; meals must be lighter than most people took – white chicken meat and eggs lightly boiled came highly recommended – fried food should be avoided, and moderation emphasised above all, specifically little or no alcoholic drink. By using common sense, he said, I could avoid the worst kind of abdominal distension I’d experienced. They gave me a letter to hand to my family doctor and told me I would be free to leave in three days. That hospital had about it a subdued air, as though cessation of intense wartime activity had left the nursing staff drained and weary. But all treated chaps like me with special kindness and consideration. They had heard about our difficulties and read about them in the papers, which now commonly carried appeals for understanding of the mental illnesses which maltreatment had given rise to in some returning prisoners. Such articles and official advice counselled patience to families if relatives, whom they knew to be alive though captive, did not come home for a time. Some of them remained stranded in countries like Poland, singly or in small groups, held prisoner in isolated villages where news of the Armistice had not yet penetrated. Some, though freed, were believed wandering, and faring badly, among a German population in a state of panic and blind disorder, having lost a war their Kaiser and his minions had always assured them would bring glorious victory and plunder. They let me use a telephone. The operator found my father’s office number and I phoned around 8.30am, knowing he would arrive at that time, but not realising he had no knowledge at all of my whereabouts. What a shock for him to hear my voice saying I was in London! “I’m going to make arrangements to leave the office for the day,” he said. “I shall come to the hospital as quickly as possible – it may be a couple of hours before I’ll see you, but I’ll hurry.” His senior clerk happily took over, he told me later, and he forsook work that day without worry or misgiving. In that happy time of victory and sudden release from war’s fears and tension, even the meanest employers helped to make family reunions as joyful as possible by giving people short, paid holidays when sons or husbands returned to their families from battlefronts. My father had never been a demonstrative man, but his greeting on that occasion was the warmest ever and added to my seething, happy excitement. The family had received only one small hint that I might be alive, he told me, just a German field-card with my name and number on it… that card given to me by a young German soldier who passed it through the barbed-wire fence of a prison camp near the Belgian-French frontier. As you may recall, I deleted some of the printed statements on it, leaving a line or two which, I hoped, meant that I was well. That soldier must have added it to the German military mail with his own correspondence and by some miracle it got through, via either Switzerland or Holland, both neutral countries. Pa looked happier than I could ever remember, and when he slipped a pound note into my hand – it was black, from the wartime, replacing gold sovereigns(4) – I really knew the “war’s over” spirit had gripped him. We talked on for a couple of hours, my adventures of such tremendous interest to him that I had difficulty in prizing out news of family doings and local matters. Finally, he went off, brimming with eagerness to tell Ma and the rest that I had reached England and would be coming home to them in a couple of days. Army Records must have worked non-stop trying to catch up with the histories of chaps like me; at the hospital, I spent some time filling in a log form covering my doings over the past year – a matter of back-pay to be calculated, for one thing. Meanwhile, they gave me an address to which I could apply for money on account, and a promise that, when the combatant nations finally declared Peace (a condition of Armistice, or truce, remained in place for months), and the Army began to demobilise, money would be available to tide discharged men over the period between leaving the Services and resuming work as civilians. This provided immediate and wonderfully reassuring relief from anxiety about one’s financial position during readjustment to a life interrupted for four years and more. Meanwhile, regular hours and good food continued the process of building me up begun by the French, British and American hospitals in France, and it showed in my appearance. My new-found confidence suffered a slight setback though, when I, with permission, visited a barber’s shop. Explaining the unkempt condition of my hair to the man brought from him assurances that he would be careful and understanding. Although I felt that washing my hair in bath or shower for some weeks had made it quite clean, he shook me more than a little by saying he had found lice in my hair. This threw me right back into the “dirty old, outcast prisoner” category for the moment. But he set to work to kill off the filthy insects and cheerfully reported them all dead and done for after several dousings in curative solutions. His charge made only a very small inroad into the quid donated by my father, but it would have been worth the lot to get rid of the last living reminder of a now past and painful period. I left hospital with various papers, including a warrant to travel free to my home, and a long questionnaire enquiring about what had happened to me in prison camps and who had been in charge. There was going to be trial and punishment for Germans who had been cruel to our men. But I thought such matters could be put aside for at least a couple of weeks. I intended to devote my time to the pleasures of rejoining the family, meeting old friends – if any had survived – and, very important, welcoming dear old Wally(5), introducing him to my parents and having him share my bedroom for a few yarn-exchanging nights, if the two single beds were still there. Everything seemed larger than life on my journey from Lewisham to London Bridge on the upper deck of a tram(6). Then, a short bus ride took me to Liverpool Street where I exchanged the travel warrant for a ticket, and in half an hour I was walking the last few hundred yards from Edmonton Green station to my home. To me, that walk was full of significance; my first time out as a completely free man, able to go wherever I chose to go, no obligation to report my whereabouts to anyone, and about to enjoy all the pleasures of reunion with the family who would be as delighted as I was that we could all be together again, free of wartime tensions. No more air raids(7) to send them into shelter under the stairs, no more stinking trenches for me. Just peace, wonderful Peace, and happy living for all for ever after. So I pushed the old iron gate open, closed it behind me, and looked up into the bare branches of the great sycamore tree which stood next to our house(8). Then, turning my back to the house, I gazed across the busy main road with its tramlines and overhead wires to the shops opposite… All small businesses and only one whose owner I had known before the war… I had usually bought my shoes from him. Looking half-right, I could see some cottages, a ladies’ hairdresser’s, a newsagent’s and an undertaker’s – the last, whose premises I now hoped not to patronise for a while yet, displaying a desirable coffin in the window. On the corner of our street, facing the funeral parlour, stood the pub, adjacent to a double-fronted dairyman’s place, a ladies’ and children’s wear shop, a grocer’s and sub-Post Office, toyshop, basket-ware emporium, and finally the watch repairer. Now to face the front door, walk up two stone steps to the old-fashioned porch – two round pillars supporting its plaster-ornamented roof – put my finger on the bell push… and set everything in motion which would begin to shape a new and, I hoped, happy and prosperous future. A moment later, my mother stood by the open door, surprised, almost shocked at my sudden appearance there. She greeted me warmly, without restraint, and I wasn’t reticent either… when we had parted, in late 1917, we had talked with some foreboding of the expected massive German attack about which the enemy had boasted openly. Over that first, lovely, Ma-made cuppa, we discussed everything as it came to mind. Considerable time passed before it dawned on me that my anticipated massive homecoming welcome had so far been limited to a mum-and-son reunion. I’d forgotten that the world’s work must go on, in spite of what may have appeared to me the Earth-shaking event of the year, my return to our family home. So Ma brought me up to date on the rest of the family. My elder sister now worked in a factory producing aeroplane wings, my younger brother made bits and pieces which went into the planes, and my baby sister attended a nursery school only two doors away from our house(9). At that time of day, Pa was at his office – and good old brother Ted remained abroad still, although our father had, with help from a friend who knew about these things, got a message through to the Observer Group of the Royal Engineers to tell him that his beloved lost brother had turned up alive after being released from captivity in enemy hands. A dispensation to allow Ted home could be granted now that hostilities had ceased. Then Ma told me the story of the German field-card in more detail. In August of 1918, Ted – home on seven days’ leave – answered a knock on the door and the postman handed him a strange card printed in, of all things, German. He understood a word or two from having worked alongside a German in pre-war days, and, of course, my signature at the bottom needed no interpretation… their first intimation for many months that, although in enemy hands, I was alive. Ma told me how the stoical, hard-hitting Ted had stood and stared, then shed tears of joy and cheered. After calming down a little, he dressed in his battle-stained(10), but now well-washed uniform and went off to the War Office to obtain further details about my immediate future and my return, if such was available. (2) Lewisham Hospital was founded in 1894, renamed Lewisham Military Hospital during World War I, and later University Hospital Lewisham. (3) My father spelt him in a less Roman way – Praeter – when the lad joined Lake & Currie as junior to even my father’s junior office boy post in 1915/16 – Chapter 11 of the Memoir. (4) In fact, private banks had issued notes since 1698, says Wikipedia, but this right was gradually eroded by law and ended in 1921; meanwhile, in 1914 HM Treasury acquired wartime powers to issue £1 and 10/- (10 shillings = 50p) bank notes and did so until 1928. (5) Wally, along with another POW called George, had formed a food-sharing syndicate with Sam during the summer while they were imprisoned near Hügelheim and in the unnamed “Lorraine village”. (6) If the doctors stuck to their prescription of three further hospital days of recovery for Sam he’d have gone home on December 13-15, depending on how they were counting. (7) German airships and planes bombed many British towns – including some strikes on north-east London – during World War I, though not on anything remotely like the scale of the World War II blitz. A fascinating detail I ran across: among the casualties of a raid on March 7, 1918, was Lena Ford, who wrote the lyrics to Keep The Home Fires Burning (music by Ivor Novello) – an American, born 1870 in Pennsylvania, she lived in London for her last 20 years and, during the war, opened her home to soldiers passing through. (8) They’d moved to 317, Fore Street, Edmonton (from 26, Lowden Road), in late 1917 – Sam happened to be home on leave at the time, jut before he shipped back to France for the last time. (9) Older sister Ciss/Dorothy (born December 3, 1894), Alf (1903), Edie (May 22, 1912). Brother Frank Sydney (June 5, 1900; Sidney in some documents) had died of diphtheria, aged 12, in 1912, the same year in which their baby brother John (April 11, 1911) died, aged 1, having “failed to thrive”. Their parents were Charles Philip (April 29, 1864, Manchester), and Lily Emma, née Fleetwood (August 18, 1872, Lincolnshire). (10) Ted had served on and around the Western Front since the Somme Battle in 1916. 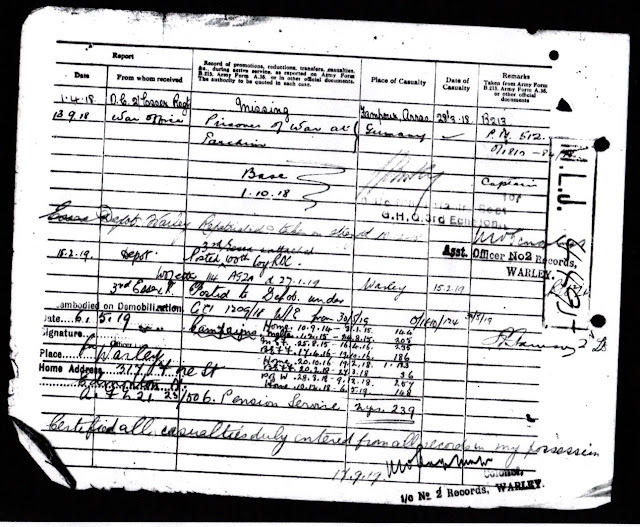 (11) The official records – so it may be true – in the shape of my father’s ‘Casualty Form – Active Service’ (see scan below) aver that news of Sam being a POW (rather than “Missing”, his previous status since April 1, 1918, after the 2/7th Essex had counted their March 28 losses at Fampoux) came through on September 9, 1918, not in August as my father recalled from talking to his mother. The form also states he was a “Prisoner of War at Parchim”. Which he wasn’t, of course, Parchim, in the far north of Germany, near the Baltic, was one of the main POW camps in World War I. So probably Sam’s chance-your-arm field-card, left in the hands of a kindly German soldier at the Sancourt POW camp, Somme department, sometime in late spring/early summer (see Blog June 3, 2018), passed through a central POW postal facility there and so onward to England via one route or another. See Footnote (11) for reference in this Blog. 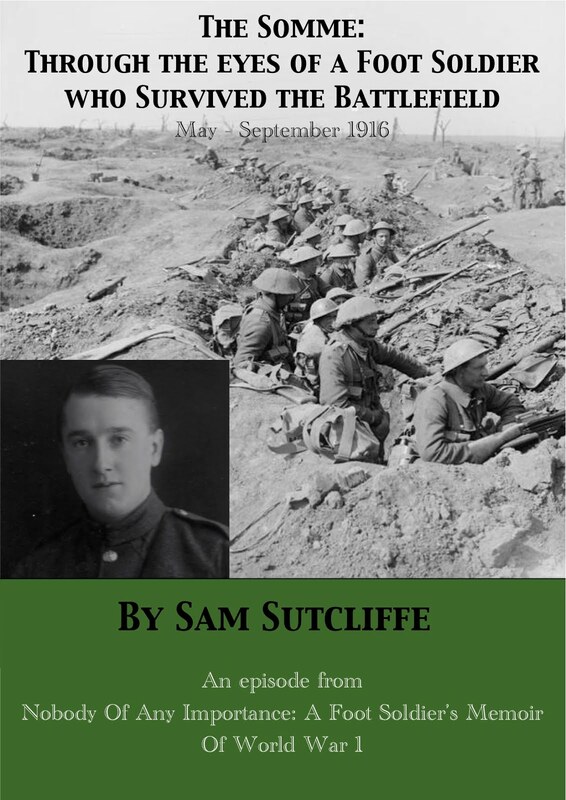 Sam’s Memoir (1) – paperback and e-book – and the e-excerpts from it are now available in their third and final editions with added Endnotes and, in the Memoir, added documentation. A hundred years ago this week, in the aftermath of the Armistice… Intermittently organised chaos proceeded with Germany beginning to frame its response to defeat and the end of Empire/monarchy. In Berlin, the Conference Of Soldiers And Workmen (December 16-19) decided on the “socialisation” of industry and set a January 19 date for election of the National Assembly – which would in turn work out a new system of government for the country. Even then (i.e. way before the Treaty Of Versailles and back-stab theory) it seems this did not look like resolving disagreements between the Social Democratic Party, the Spartacists and monarchy loyalists. Meanwhile, further east, the 200,000 German troops commanded by Field Marshall Mackensen’s march home from Romania was interrupted near Budapest by an Allied force up from the Salonika campaign and beyond – a wonderfully multinational mix of Greeks, French, Serbians, British and Italians – led by French General Franchet D’Espèry. Mackensen, who’d hoped never to surrender and later as a right-wing politician said he had never surrendered, had to surrender (December 16). Meanwhile, the turmoil around the Baltic evolved uncertainly as the last German troops left Finland, British Naval ships bombarded Bolshevik positions in formerly Russian Wesenberg, Estonia, and Bolshevik troops advanced near Pskov on the Russian side of the Estonian border (all December 16) and entered Walk (18; lately evacuated by the German Army, on the border of Estonia and Latvia, formerly in Russian Livonia). Further south, the Ukrainian upheaval continued with the “revolutionary” force led by General Petiyura taking Kiev (December 20). I can’t find any reference to their political angle – do say if you know! – but it’s of only passing significance given that control of the capital (since 1917) changed hands 16 times in the next 20 months. 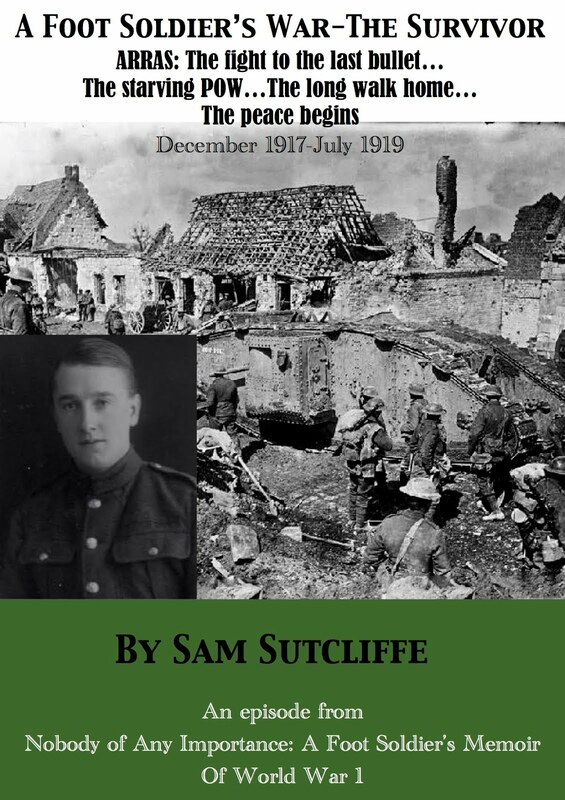 November 25ish-December 10, 1918, a British RAMC hospital in Nancy, France… where, last week, after eight months of slow starvation as a POW and, post-Armistice, a four-day walk back to the French lines – my father, Signaller Sam Sutcliffe, was recovering from these privations following an initial stint in a French military hospital where he experienced a brief, purgative emotional breakdown, a Champagne-and-brandy cocktail diet to ease his delicate stomach, and the kindness of wounded poilus comrades with whom he shared a massive ward. ‘Back at the hospital I asked the storekeeper whether he could give me a British uniform, but he said they had none to issue. So my intention to procure a khaki outfit of some sort set me searching in a marquee, the side curtains or brailing of which I noticed were always closed and secured by cords. I detached one cord loop from its ground-peg and slipped under the canvas. Immediately, I saw a large, rectangular stack of clothing and kitbags, much of which had belonged to soldiers of the British Empire. Although the RAMC had established this Field Hospital to care for Independent Air Force personnel, in some emergency they must have taken in and treated ground Forces. Discovering some bundles comprising complete kits – a kitbag filled with underwear, boots, socks, tied to a uniform, greatcoat and headgear – I realised that the former owners had died. I spread out one of these outfits, tried on the trousers and found they fitted perfectly. The quality of every item in the bundle was much superior to that of the usual Army garments – the grey socks of thick wool, plain not ribbed, the greatcoat a gem of fine, close-woven wool with shoulders somewhat padded to produce a natty squareness. No epaulettes, though, and I feared their absence might be noticed (almost unbelievably, it was never commented on). Knowing that all this gear would be destroyed or sold off, I dressed myself in the fine, warm clothes, with a cosy cardigan under the tunic – this must have been late November or early December – and filled a kitbag with spare underwear, socks, shaving tackle, towels, and even tablets of soap. I easily found a comfortable pair of boots in my medium size, and very well-made of supple leather, not too heavy. My French blue uniform I folded neatly, laying that too-small forage cap on top before selecting a replacement with no Regimental badge, but definitely of a size large enough for my big bonce (it had ear flaps too which folded neatly round the brim when not in use). My old, dingy underwear I threw into a corner of the tent, together with those tattered German jackboots I had worn for several months past. Donning all these fine clothes, I felt warm in a way that had been unknown to me as a war prisoner. Kitbag over my shoulder, I marched away from the marquee feeling, at last, a Britisher once more. Nearing the end of the year, living under canvas could have been unpleasantly cold, but a huge, anthracite stove kept each marquee warm inside. Its metal chimney poked through a fire-proofed exit hole in the ridge of the tent. Fuel was brought in by men of a nation I had previously encountered only in the pages of cheap magazines which portrayed them as rather sinister people who moved in the sleazy atmosphere of Docklands eating houses, opium dens, the cabins of mist-enshrouded ships – even sewers. Occasionally, the action took place in a London West End mansion, the interior a replica of a Chinese temple wherein the vile Fu Manchu tortured and murdered his victims. Unless, of course, the great and remorseless Mr Something Smith(2) chanced to be around to circumvent him. Nothing sinister, though, about the two Chinese men who refilled our stove so frequently. I made friends of them and we talked for a moment or two at each of their visits. No language problem; they spoke English well enough for me to learn they belonged to the Chinese Labour Corps(3) formed to do chores for our Army and, thus, free the maximum number of British men to fight in the front line. I never heard of a similar scheme to free Staff Officers for front-line duty. These chaps told me they did most of their work in the officers’ kitchens and mess, not far from the hospital. Although well-fed, they found living in tents in winter-time very cold. They said they needed warmer clothing as the cotton garments they wore were thin and they shivered all the time – none of them knew the English for “shivering”, they conveyed it by illustration. This reminded me of the dead men’s clothes tent and that pile of cardigans, one of which I had appropriated, lying spare. Soon we had devised a contract which resulted in a daily rendezvous near the entrance to the officers’ quarters and the swift exchange of small parcels, a cardigan for a piece of cheese or some other tasty morsel. This did not seem to me a terribly wicked trade, for my friends needed warm clothing and I, still weak and thin, could benefit from additions to the necessarily austere diet available to an ordinary soldier at the end of a long war. So, as long as the supply of cardigans lasted, I met my customers’ requirements, conscience easily salved by averring that the transfer of unused clothing from one branch of our Service to another served the purposes of all concerned. Certainly my Chinese friends agreed with my line of argument, and their smiles and thanks and reciprocal nourishing gifts did me a power of good(4). Washing and shaving daily, showering when my turn came, and feeling comfortably warm in my new clothing, all helped to restore lost confidence. In fact, throughout my stay at the Independent Air Force Field Hospital happiness was my lot, with the generous spirit of the Major matched by the all-male staff’s efforts to rehabilitate us. But decisions made somewhere resulted in us returned prisoners being removed to an American hospital near Rouen(5). Strange that, at the end of the war, I should spend the last of my days in France in the place where I had camped after arriving from Egypt in 1916… That seemed way back to me. This time, I was not allowed to go into town, but such was the kindly treatment freely given by the American doctors and the lovely nurses that only an ingrate would have wished for more freedom. They told me I could be examined and treated by doctors at any time, and a cheery chap showed me round the place. When we entered the large hall where they served meals, he told me that an order issued regarding returned prisoners gave us the privilege of going back to the service counter after finishing our first plateful – up to three times if we so wished. I did this, but not three times, two proving the limit of my greedy capacity. First the generous American Air Force officer in Nancy, now the open-handed Yanks at Rouen… I could think of no way to show my appreciation of their many kindnesses, except by thanking them on every appropriate occasion. The hospital wards consisted of roomy Nissen huts with two rows of beds separated by a gangway – quite similar to the civilian equivalent. We had no money, but GIs welcomed us into their combined canteen and entertainment hall, curious about us because they had not met many Britishers. Some of them had come straight to France without landing in Britain, I gathered. When fully satisfied with regard to food and drink, one could mooch across to the rows of chairs facing a stage on which some kind of performer would be doing his stuff. Certainly the best of all the “turns”, in my opinion, was the American chaplain, whose straight-faced jokes and yarns kept the troops in stitches – without, of course, using any smutty gags, he kept going for longer than any comedian I had seen before and could have converted me to whatever his religion was, had he been so inclined. German prisoners did chores around this hospital… And how, I felt, have the tables been turned. I sometimes watched them working in the grounds and noticed that they often found reason to be in the vicinity of the kitchens. I moved closer and saw that, when the cooks dumped food waste into tubs outside the kitchen doors there, the Germans would dash to get at the swill and reach in up to their elbows, searching for solids. When all had been taken, they returned to their labours. But on one occasion – as I could see from my position on the highest point of the grounds – soon after raiding the tubs and resuming their tasks, most of them began to totter around and then collapse. Unaffected prisoners ran for help and soon stretcher-bearers were carrying sick men away. Later, I learnt that, by some accident, a poisonous substance had found its way into the waste food. Conjecture was rife about an American taking revenge on the Jerries for the horrible treatment inflicted on some Allied prisoners. But I thought it more likely that someone who had no knowledge that the German prisoners searched the waste tubs for food had dumped the poisonous stuff there. Lying in my bed one dark night when most of the men were asleep, I heard the voices of a man and a girl, then some quiet laughter and kissing. I realised the couple were leaning against the thin wall of our hut about six inches from my head. Your imagination can improve on what would have been my description of subsequent developments, but I recall feeling glad for them. What sort of a war had they had, I wondered. At last, the stream of bloody and broken men had dried up and they could relax and give some really leisurely attention to more attractive occupations. For the first time in many a day I thought about girls and all that. Evidently nothing wrong with me that a few stouts and oysters wouldn’t put right – I hadn’t so far tried that diet, but had often heard it recommended for older men who had failed to rise to significant occasions. (2) Mr Something Smith: that’s Denis Nayland Smith who, along with his Dr Watson-style back-up, Dr Petrie, regularly foiled Fu Manchu in the Sax Rohmer “Yellow Peril” stories published from 1912 onwards. (3) The Chinese Labour Corps: founded 1916, after then General Haig said he needed 21,000 labourers; the first CLC ship-load sailed from China in January, 1917, and arrived in France three months later; by Armistice Day, they numbered 96,000; most were given transport home in 1919-20; perhaps 10-20,000 are said to have died during the war, chiefly from Spanish Flu; other Labour Corps recruited more than 300,000 men from British colonies, including Egypt, Fiji, India, Malta, Mauritius, Seychelles, the British West Indies and South Africa. (4) Regular readers of my father’s Blog may recall his holding forth against “scrounging” on several occasions. And here he is, scrounging. Well, I’d say he was a very solid citizen, but not quite saintly in consistent application of his high moral standards to himself. (5) American hospital near Rouen: information at http://ow.ly/ygaa30kUzLRsuggests this was probably Base Hospital 21, located on the Champs Des Courses racetrack, and staffed mainly by doctors and nurses from Washington University Hospital, St Louis (they took it over from the British in summer, 1917); it had 1,300 beds and remained active caring for former POWs until January, 1919. Although dates are impossible to pin down with certainty after my father crossed the French front line, his reference to staying at the RAMC hospital in what “must have been late November or early December” suggests his short Rouen sojourn occurred roughly December 1-10 (see footnote 7). (6) Alcock and Brown: John Alcock from Manchester and Arthur Brown from Glasgow, both POWs during World War I, the former shot down in Turkey, the latter in Germany, made the first non-stop Transatlantic flight in June, 1919. 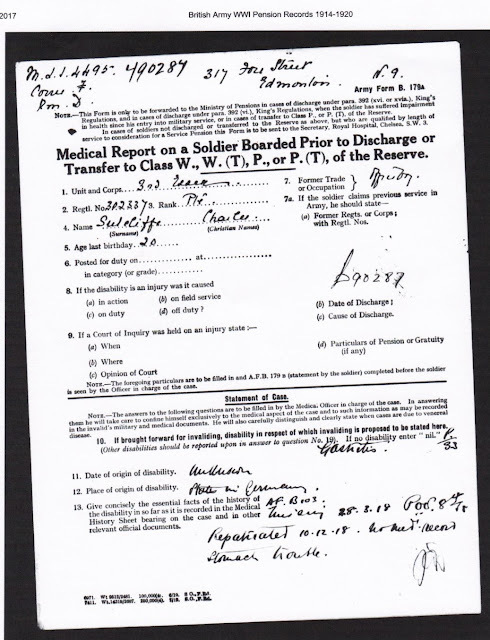 (7) One of two records of his return to England occurs on an Army pensions document, ‘Medical Report on a Soldier Boarded Prior to Discharge or Transfer to Class W., W (T), P., or P. (T), of the Reserve’ (where “boarded” means examined by doctors to check his medical condition ergo his disability pension entitlement – 10 per cent of Army wages the verdict in my father’s case). It says he was “Repatriated 10.12.18” (see below: scrawled date and “diagnosis” bottom right), which could well be correct or close to (bearing in mind these documents can be wrong - including in my father’s case a couple of times). This date occurs also, in different scrawl, on the second page of his ‘Casualty Form – Active Service’ (also below, noted twice, once in faded ink in the middle of the page, then again last of the list of dates – most correct, one or two probably not – handwritten very small to the lower middle right; apologies, you may need a magnifying glass if you’re curious about all the detail). See footnote (7) immediately above for details about these two documents.